Napa Valley Register/JL Sousa via Associated PressLaw enforcement members stage near the Veterans Home of California after reports of an active shooter Friday, March 9, 2018, in Yountville, Calif.
An armed man and three hostages were found dead at a veterans’ home in Northern California after a daylong standoff with police. The suspected gunman and hostages were inside a room in one of the buildings at the facility, and hostage negotiators had been unable to make contact with the suspect. The gunman is believed to have been a veteran and a former patient at the veterans’ home. A gunman and three hostages were found dead on Friday night after a daylong standoff with police at a Northern California veterans’ home, law-enforcement officials said. 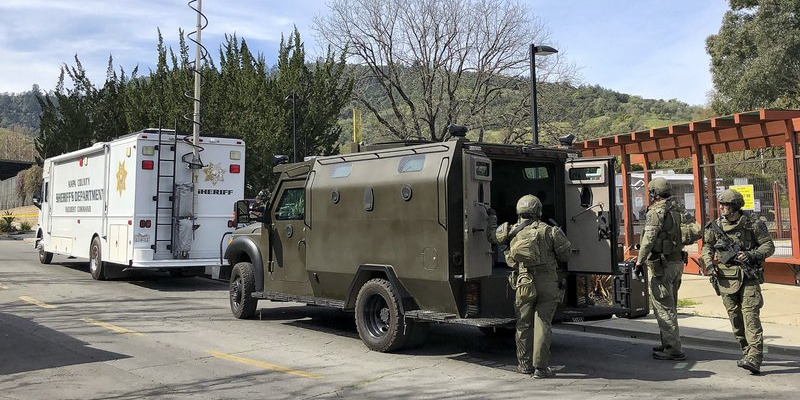 The male suspect, armed with a rifle, exchanged fire with a sheriff’s deputy and kept the three female hostages detained in a room at the Veterans Home of California-Yountville throughout the afternoon. Police breached the room shortly before 6:00 p.m. local time, according to California Highway Patrol assistant chief Chris Childs. Law enforcement officials reportedly identified the victims as executive director Christine Loeber; Dr. Jen Golick, a therapist; and Dr. Jennifer Gonzales, a psychologist. The Napa County Sheriff-Coroner’s office identified 36-year-old Albert Wong of Sacramento as the suspected gunman. The husband of one of the workers at the home told the Associated Press that the gunman took the hostages after he slipped into an employee going-away party in the building, detained certain people, and allowed others to leave. “There was a going-away party for a couple of the staff who were leaving today. Today was their last day. They were having cake and toasting and apparently he just walked in with this rifle,” Larry Kamer, a former employee, said. The suspect was believed to be in his 30s and had been discharged from the treatment program two weeks ago, according to The Napa Valley Register. The gunman was asked to leave the program after he broke certain rules, NBC Bay Area reported. The initial reports of an active shooter at the Veterans Home of California-Yountville came in around 10:30 a.m., local time, a spokeswoman for the department told the San Francisco Chronicle. Authorities set up a hotline at (707) 948-3331 for people to call for information on their loved ones at the veterans’ home. The facility is the largest veterans’ home in the US, housing roughly 1,000 elderly or disabled veterans and their spouses, according to its website. The program treats Iraq and Afghanistan war veterans with post-traumatic stress disorder, and helps them reintegrate back to civilian life, according to KRON-4 News and The Washington Post.